I was worried about giving their buffalo jerky a fair shake in my review, since I have no doubt they wouldn’t have sent me the sample were they not fairly confident I’d like it. I just happened to dislike peppered jerky just like I happen to dislike mushrooms. Would it be fair to discount a gourmet dish prepared by Iron Cheff Bobby Flay simply based on the inclusion of mushrooms? No, it wouldn’t. And that’s why I was worried about this review. Of course that worry was decisively quelled the second I opened up the bag and gave the stuff a try. Aside from “delicious,” one word can describe the taste: balance. Jerky.com’s peppered buffalo jerky is quite possibly the best jerky I’ve ever tasted. Before you dismiss that claim as hyperbole, consider that beef jerky might as well be its own food group for me, and that I live just down the street from a very popular local jerky manufacturer. Anybody can gather good ingredients, just like prominent sports teams can buy the best players. But as any sports fan will attest, if the team doesn’t have chemistry, they’ll fall short every time. And while the fine ingredients used to create this buffalo jerky certainly play their part, it’s the balance of those ingredients that makes it so good. I quickly realized that I don’t hate peppered jerky—I just hate how the pepper upstages all of the other flavors in every other peppered jerky I’ve tried. Don’t get me wrong, the pepper here isn’t muted. It simply knows its place: to enhance rather than define. The buffalo itself is amazing. I’ve always preferred it to beef when it comes to jerky. Buffalo isn’t gamey at all, and it’s much healthier than beef. The soy sauce and pineapple juice marinade used here brings out the natural flavor of the buffalo meat impeccably. When it comes to texture and chew, this stuff gets a solid A. One element that’s often overlooked by jerky makers is manageability. I was able to portion out slabs of the jerky with one hand while negotiating a rough doubletrack in my minivan (see my recent post about bushwhacking near Iosepa), proving that jerky doesn’t need to be processed and formed into bite-sized nuggets in order to make it a good on-the-go snack. In short, Jerky.com’s Buffalo Jerky is a satisfying balance of salty and tangy that is positively addictive. My advice? Exercise restraint and savor it when you get yours in the mail. Because even if you go with the big pack, all too soon you’ll wonder where it went. Buffalo Jerky comes in 2 and 8 oz. bags ($9.99 and $25.99 respectively, free shipping). Buy it here. I don’t know if my review of Jerky.com’s pineapple jerky generated any business for them, but they must have been at least somewhat pleased, because I received another package from them the other day. “I’m sending you some of the good stuff,” read an email from Jerky.com president Doug Iske a few days prior. Excellent, I thought. Some sweet and spicy kobe beef jerky, or maybe some of those gourmet elk strips. Nope, the guys at Jerky.com surprised me again. And this time, I gotta say I was a little overwhelmed by the contents of my sample bag. I’ll admit I listen to a little Art Bell from time to time– when I’m driving at night and have decent AM reception. But I’m a natural skeptic. And the last time the word “Sasquatch” entered my mind was the day I saw “Harry and the Hendersons” at the theater. Last time I checked, big foot was still a myth. So how these guys 1) captured the animal, and 2) made it into such a delicious smelling snack, I’ll never know. I didn’t ask questions. The pleasantly light, savory aroma brought the wheels in my head to a screeching stop. For some reason I thought Sasquatch would be gamey, or at least have a heavy iron aftertaste, like duck. I didn’t expect it to taste similar to venison. The hint of liquid smoke– if that’s what it was– was unnecessary. The meat’s natural flavor stands on its own. Had I checked out the price on Jerky.com’s Sasquatch Jerky product page before I devoured most of my sample pack, I would have taken more time to savor it. I’m not going to lie, an 8 oz. bag of this stuff will cost you a pretty penny. But given the rarity of sasquatch and, as Doug explained, the cost and red tape involved with drawing a sasquatch tag in Oregon, the price isn’t half bad. I’ll leave the hunting and politics to Jerky.com’s contractors. I’m still enjoying the aftertaste of my last piece of sasquatch jerky. Even if you don’t have $500 to drop on a bag of this exotic stuff, it’s worth checking out anyway. Thanks again for the sample, jerky guys. Another excellent product. Sasquatch Jerky comes in 8 oz. bags containing a generous 8-10 slices ($499.99 with free shipping). Jerky.com: The widest selection of U.S. made jerky products to fit every budget. So I was a bit surprised when I received a package of actual pineapple slices. As jerky-savvy as I pride myself on being (it’s been a staple of my existence as far back as I can remember), I was unaware of the industry’s forays into the jerkification of actual fruit. Not that the concept of dried fruit has eluded me. I just never thought to call the mango chunks in my trail mix “jerky.” Maybe that’s because dried fruit usually comes so infused with sugar that it looks and tastes more like a cheap candy than fruit. The ingredients in Jerky.com’s pineapple jerky? Pineapple, honey. Period. Good jerky is prepared with the intent of preserving and highlighting the natural flavors of the food. I’m happy to report that Jerky.com’s pineapple jerky achieves that goal in delightful fashion. Kudos to whomever came up with the idea of dehydrating slices of fresh Maui pineapple and glazing them with honey. I ate one slice immediately after the package arrived and vowed to save the rest for later. Another 10 minutes didn’t pass before two more were gone. The slices in my sample were supple and much less sticky than I imagined when I read “honey” on the label. Each slice was thick enough to be satisfying, but thin enough to bite right into with my front teeth (no folding or pre-tearing necessary– excellent). The pineapple’s full taste was front and center, the honey a very subtle undertone. It was obvious that the Jerky.com team put some serious thought into this snack. I know what you’re wondering: How’s the core? Can I eat the core? Indeed, dear reader, you can. The cores in my sample varied slightly in texture from slice to slice, which I imagine is because not every slice in the bag comes from the same fruit. Some cores had a near-perfect consistency while some were a little on the pulpy side. I don’t eat the core parts of raw pineapples, but in their jerkified state, they’re a surprisingly edible bonus. I felt like I needed to put on a little Jake Shimabukuro or Jack Johnson music to fully enjoy the rest of my sample, but the remaining slices didn’t last that long. Bottom line: Jerky.com’s all natural pineapple jerky is just plain good– made in the true spirit of jerky, and worthy enough to carry along on any adventure. Pineapple Jerky comes in ¼ pound bags containing 5-8 slices ($9.99 with free shipping). [UPDATE 12/07/2009 My site stats show this post gets a lot of hits, so I would do potential Tarpeez buyers a disservice if I didn’t post an update on my Tarpeez tarp. I stand by my review below, but I should let you know that mine broke just over two months after I wrote it. Can’t speak for the truck, but Tarpeez has my trailer covered! Two things you can never accuse me of are being normal or fitting in. So it should come as no surprise that my very first gear review centers on the “unorthodox” use of the product in question. 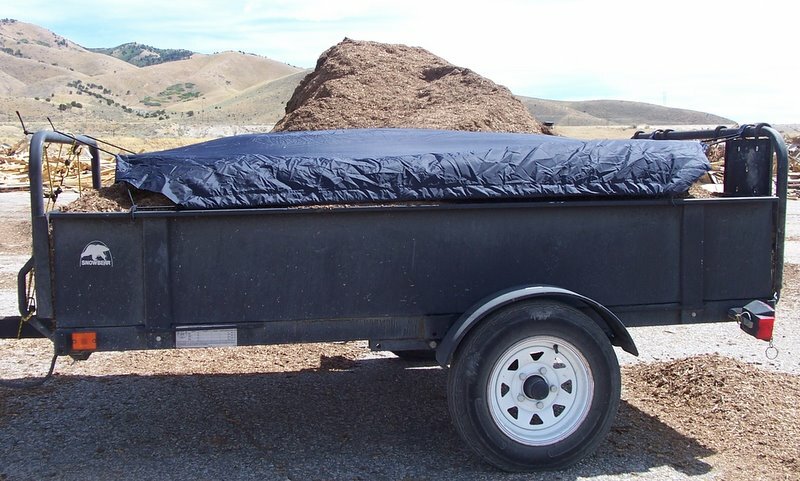 Now before the people at Tarpeez start sweating bullets, let me just state up front that while I have no idea how well their truck tarp works on a truck, it definitely earns an ‘A’ for its performance on my trailer. Long story short- I received a standard-size tarp. My dad’s truck has a full-size bed. 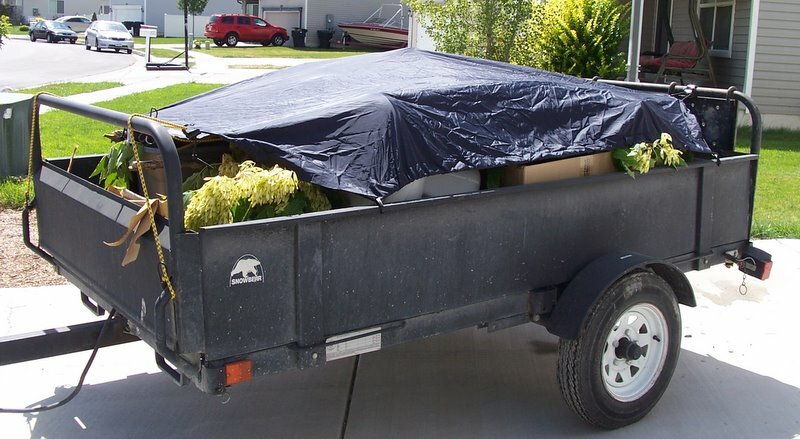 Not a problem, because the tarp was a near-perfect fit for my 4 ½’ x 8’ SnowBear utility trailer. Between landscaping, camping, and trips to the landfill, I do a lot of hauling with my trusty SnowBear. Up until I received my Tarpeez review unit, my search for a functional, non headache-inducing canopy for the trailer. Run-of-the-mill tarps are always either too big or too small, which meant weaving two smaller tarps together or rolling with an oversized parachute. Other more creative options were always sub-par, and I haven’t the patience to deal the tangled nightmares of a net. So when “dumps day” rolled around this month, I decided to visit the Tarpeez website and put its claims to the test. 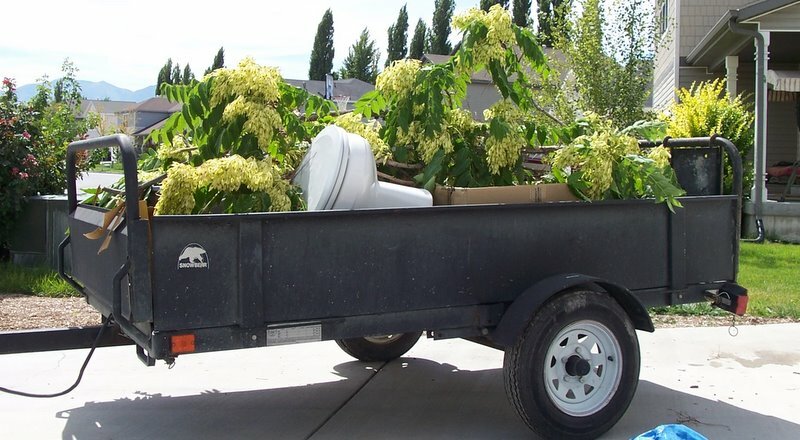 My load included boxes, tree branches, and a toilet. Since the tarp was specifically designed for use on a truck bed, I expected to take extra time figuring out how to secure it to my trailer. To my surprise, the single, continuous bungee and strategically placed hooks adapted well to the bars and walls on the trailer. In fact, it took only a minute to throw it on and secure the load. Broken ceramic and sharp jutting branches strategically placed so as to thoroughly test the company’s claims of durability didn’t so much as scratch the tarp’s smooth, hearty material– even after a faster-than-normal detour down a barely passable dirt road. And though the canopy didn’t completely cover the load, none of the smaller items escaped along the way. On the way back home, I picked up a load of loose compost. Again, the tarp was easy to install and kept the load secure for the duration of the trip. But my Tarpeez cover had one more test to pass when I got home– the test failed almost by tents, sleeping bags, and other tarps– the “will it fit back in it’s stuff sack” test. I’m happy to report that my Tarpeez easily stuffed back into it’s bag in about 20 seconds. 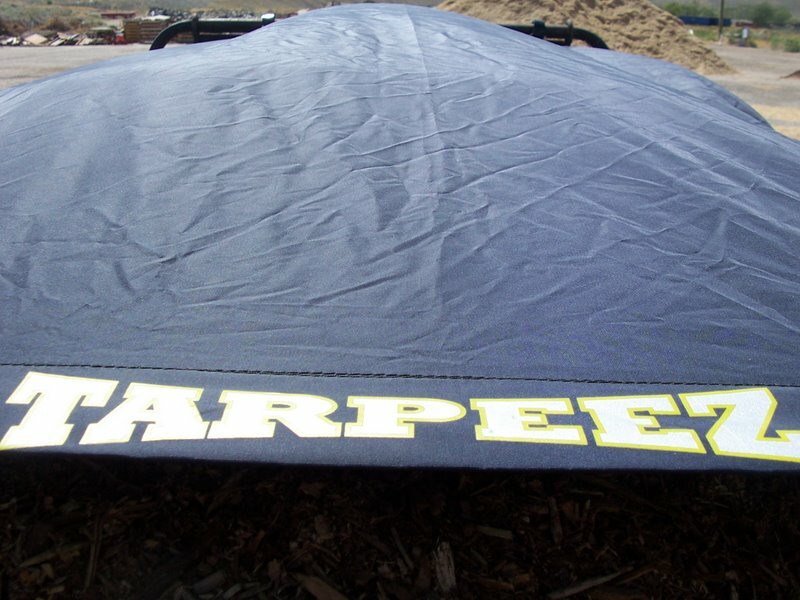 The verdict: Tarpeez soft cover tarps are simple, tough, functional, and adaptable. Now that I’ve got the trailer covered, I can’t wait to get one for the truck. Check them out at www.tarpeez.com.